The great social and economic challenges of the next decades include climate change, natural hazards and the sustainable supply of water, energy and raw materials. Meeting these challenges requires essential input from the Geological Sciences, derived from our understanding of how minerals, rocks and mountains form and interact with earth's hydrosphere and atmosphere. Our Institute of Geological Sciences is recognized internationally for its fundamental research into the origin and evolution of the earth and for its applied research into natural hazards, mineral resources, geoenergies and geological disposal of waste. To understand the underlying natural phenomena we perform field work throughout the world, we analyse samples in our state-of-the-art laboratories, we perform experiments to reproduce natural phenomena and we link these findings through computer modelling. We offer an attractive 3-year Bachelor curriculum in Earth Sciences that combines lectures, seminars, excursions and field work in a collaborative atmosphere with individual supervision. 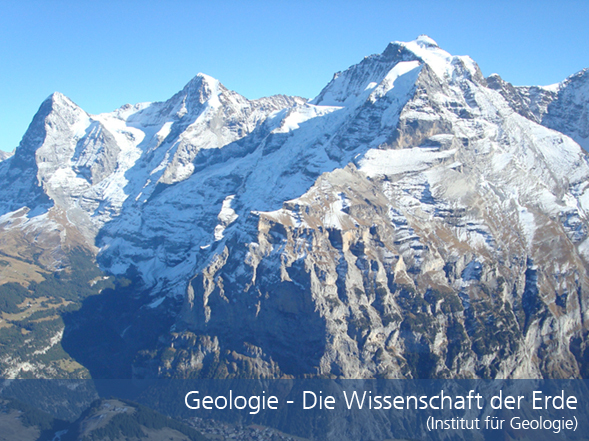 In our 2-year Master curriculum, taught in conjunction with the University of Fribourg, students can follow their interests and specialize in various subdisciplines of Earth Science. Our graduates find employment in a wide spectrum of industries, government agencies and research institutions. Planet Earth is our lab – Join in! The 2019 Robert Wilhelm Bunsen Medal is awarded to Daniela Rubatto in recognition of fundamental and far-reaching accomplishments in metamorphic petrology, mineralogy, geochronology and tectonics. 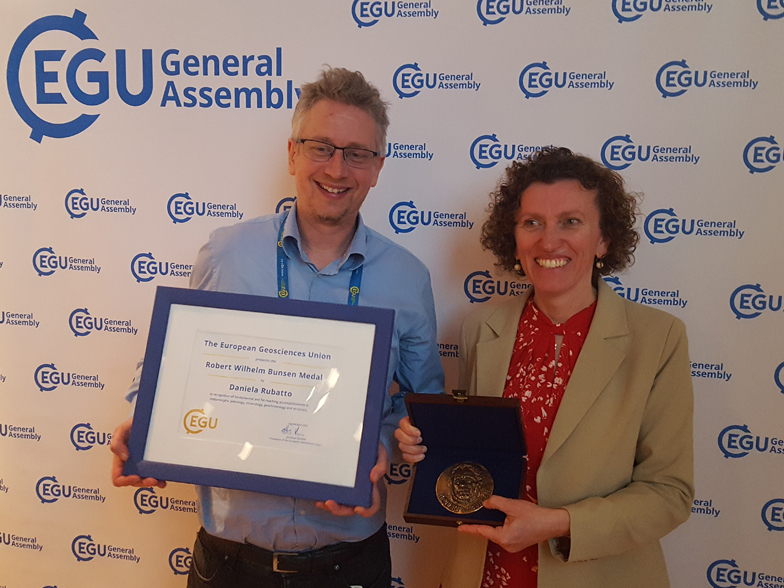 Daniela Rubatto received the prize on April 9 at the European General Assembly in Vienna. Congratulation! The Rock-Water Interaction group and the PFLOTRAN development team at Sandia National Lab will organize a shortcourse in the use of PFLOTRAN from June 4-6, 2019. Report from the Antarctic: Naki Akçar successfully sampled 35 boulders and started with flight missions of the unmanned aerial vehicle in order to reconstruct high resolution digital elevation model of the study area. Our researcher Naki Akçar is again on an antarctic research tour. The assessment of the stability of Antarctic ice sheets and of their contribution to the global sea level change as a response to climate change requires the reconstruction of their past volume variations. You find our colloquia and seminars in the weekly program about 2-3 weeks after the start of the semester.